The New York Jets are set to start training camp and despite the shortcomings of last season, hope to be one of the more competitive teams in the AFC East, if not the entire AFC this year. While there are still positions with levels of uncertainty, the Jets managed to put together a relatively strong offseason and have brought in key players that may be able to bring this team to another level. One of the few things that the Jets have heading into training camp that they have not had in a while, is options at the quarterback position. Currently the team has three quarterbacks on the roster in Josh McCown, Teddy Bridgewater and their first-round draft pick, Sam Darnold. While McCown was the starter last season, his performance graded him as the 23rd-best quarterback in the NFL, finishing the season with a 77.1 overall grade. This leads to the idea that, while McCown is certainly a viable option, the Jets starting quarterback competition will be an open competition. Signing Bridgewater this offseason was more of a low-risk, high-reward scenario. The Jets gave the former Minnesota Vikings quarterback a one-year deal following a year he spent recovering from a significant injury. While this was certainly a worry, early signs point to Bridgewater looking like his old self. 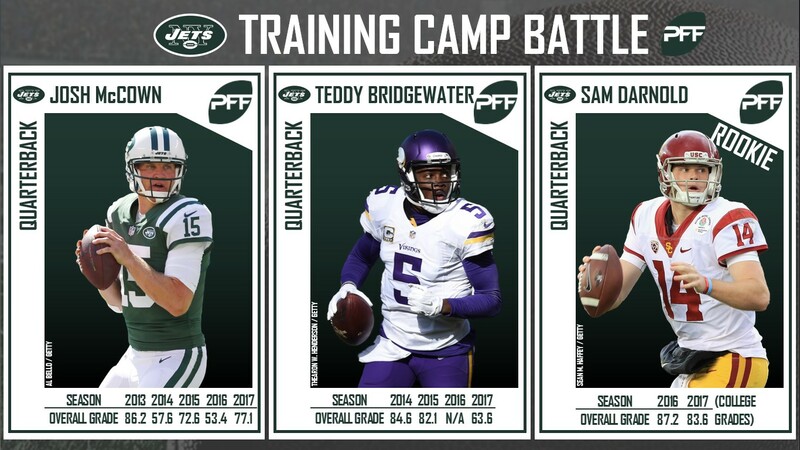 Reports out of the Jets offseason training activities were all about how well Bridgewater performed and that he may be able to start this season. Back in his last season as a full-time starter, Bridgewater was a quality option, receiving an 84.6 grade in 2014 and an 82.1 grade in 2015. While Bridgewater is certainly one story to watch for, most of the attention will be on the former USC quarterback. Darnold has all the intangibles that teams look for when evaluating quarterbacks: height, arm, intelligence. When looking at the numbers to see how well he utilized these traits, it is easy to tell that he was a very capable quarterback in college. He finished the 2017 season with an overall grade of 83.6 and finishing the season as the nation’s third highest-graded quarterback outside of a three-week slump. Expectations should be high that one of these quarterbacks solidifies himself as the starter for this Jets team come Week 1. The hope is that with consistency at the quarterback position, the entire offense will be significantly improved. This group may contain some big names, but big names don’t guarantee great ability and when you look at the stats, the Jets secondary in general is a group in which a lot of uncertainty resides and needs to be addressed in training camp. They find themselves ranked 22nd in our preseason secondary rankings. The splash signing for the Jets this offseason was former Rams cornerback Trumaine Johnson. Since 2015, Johnson has failed to receive a grade higher than 80.7 in a season and last year finished with an overall grade of 74.2, which ranked him as the 68th-best cornerback in the league. As such, he was featured as a free agent to avoid this offseason. Looking further at the Jets secondary, the one bright spot is Jamal Adams. He showcased his ability last year, finishing his rookie season with a grade of 81.2. While Adams was capable of being a solid safety in coverage, where he really excelled was in his run defense as he graded as the seventh-best safety in the league against the run (87.7) which landed him ahead of the players such as Kevin Byard (86.1) and Landon Collins (83.8) in that category. With his strong debut performance, Jets fans should be excited by what his sophomore season may bring. 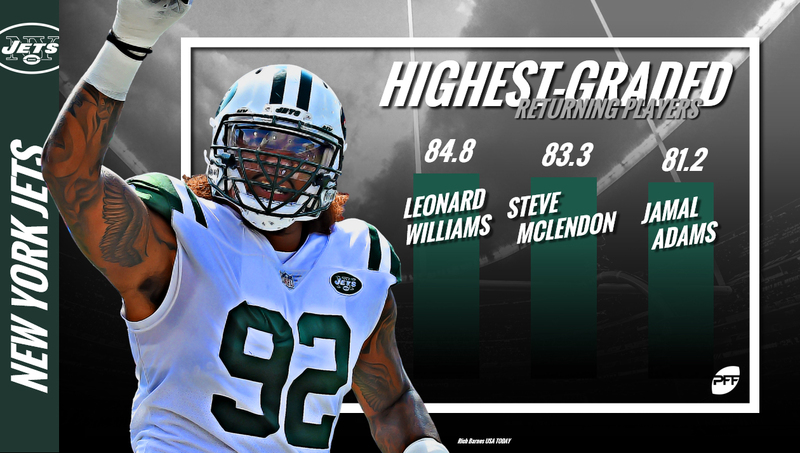 The rest of this defense looks like a formidable group as Leonard Williams leads a talented defensive line while they managed to sign inside linebacker Avery Williamson this offseason. The former Tennessee Titan had his best season in 2017 registering 32 defensive stops and graded out as the 10th-best inside linebacker in the league. Bringing all the factors into consideration, if the Jets can manage to cover up for some of its holes on the backend of the defense, this is a team that could make noise in 2018. So long as their quarterback option has been figured out.